We appreciate all those who support Hope 4 Hannah. Here are some of our supporters. Again we wanted to thank all those who supported the 4th Annual Hope 4 Hannah Run/Walk this year!!! We had the biggest turnout this year, with over 150 people signed up! We hope that everyone had a great time at all the family events! Thanks again for the wonderful support! 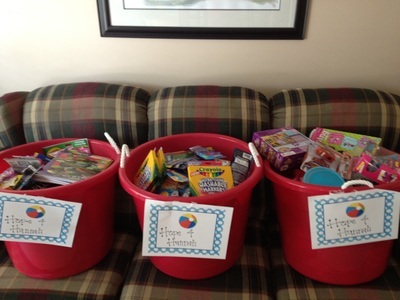 We wanted to thank these businesses and families who graciously donated items and money within the last few weeks. Farmer's Insurance-Matt Wolk District Manager for the $25 Best Buy Gift Card. Bobbi Pegg & Lisa Winthrop for the Bird Feeder Gift Basket. JC & Shelly Anderson for the Golf Lesson from a Former PGA Tour Player-JC Anderson. Eric Meyer & Weiss Insurance for donating the One Day Insurance Policy for our run. ​Again thanks to everyone who helped make this run such a success this year!!! We are currently in the process of seeking donations and items for a silent auction for our Hope 4 Hannah race on June 17, 2017. These businesses and families have graciously donated items and money within the last few weeks. Chris Schafer-Heavy Smoke BBQ Team for his donation of a BBQ Smoked Rib Dinner with sides for 25 people-valued at $400 plus. Simply A Princess for donating "Princess Time" at the walk/run. DCK DJ's (Chuck Miller Jr.) for donating his DJ services at the walk/run. Martin Trophy for their donation of 4-First Place Medals for the run. Kerstin Hitschfel for donating 2 Qikcover Waterproof Vehicle Seat Protectors-Valued $80. Cheri Champagne for donating a "Gift Giving Basket." ​Thanks again for all those supporting this great cause!!! We are currently in the process of seeking donations and items for a silent auction for our Hope 4 Hannah race on June 17, 2017. These businesses have graciously donated items and money within the last few weeks. Bunzl USA, Inc. (One City Place, Suite 200, St. Louis, MO 63141) for their donation of $543. Stubblefield Family for their generous donation of a Gold Level Sponsor. Air Evac Lifeteam (1001 Boardwalk Springs Place #250, O'Fallon, MO 63368) for their donation of $250. John Cage for his donation of "4 Cardinal Baseball tickets-total value of $364." Jimmy O'Donnell for his donation of "2 Cardinal Baseball tickets-total value of $318." BG Services Inc. (400 Axminister Dr, Fenton, MO 63026) for their donation of $400. Sheri & Anna Meyer for their generous donation of the Bronze Level Sponsorship. CrossFit Trenches (8674 Orf Road, Lake St. Louis, MO 63367) for their donation of "1 month unlimited membership." Kenney Family for their donation of a $50 Build-A-Bear Gift card. QuikTrip (1150 Feise Rd., Dardenne Prairie, MO 63368) for their donation of $500. Peoples Savings Bank (5000 Winghaven Blvd, O'Fallon, MO 63368) for their donation of $500. The Morgan School (7401 Highway N, O’Fallon, MO 63368) for their donation of $250. Complete Fitness (6225 Ronald Reagan Dr., Lake St. Louis, MO 63367) for their donation of $250. ​The Chiropractic Wellness Connection-Dr. Jason Hamed (111 O’Fallon Commons Dr., O’Fallon, MO 63368) for their donation of $100 worth of Wellness Essentials. Steve Bommarito & Edward Jones (9969 Winghaven Blvd., Dardenne Prairie, MO 63368) for their donation of $500. Roden’s Landscaping, Inc. (7800 Hwy N, O’Fallon, MO 63368) for their donation of $250. Hilton Garden Inn (2310 Technology Dr., O’Fallon, MO 63368) for their donation of a one night weekend stay including breakfast for 2 adults. Sugarfire (9955 Winghaven Blvd, O'Fallon, MO 63368) for their donation of a gift basket worth $100- two BBQ sauces, BBQ rub, t-shirt, $70 worth of gift certificates. Llywelyn’s (7434 Village Center Dr, O'Fallon, MO 63368) for their donation of a $25 gift certificate. ​Painting with a Twist (3004 Winghaven Blvd, O’Fallon, MO 63368) for their donation of a $70 gift certificate. Keith & Lori Meuser family for their donation of $250. CeeKay Supply Inc. for their donation of $250. James & Melinda Meuser family for their donation of $50. Regal O’Fallon Stadium 14 (900 Caledonia Dr, O'Fallon, MO 63368) for their donation of 6 movie tickets. Red Robin (7821 Highway N, O'Fallon, MO 63368) for their donation of 10 free appetizers. Outback Steakhouse (4002 Winghaven Blvd, O'Fallon, MO 63366) for their donation of a $20 gift card & appetizer. Wehrenberg Theatres-Town Square (7805 Highway N, Dardenne Prairie, MO 63368) for their donation of 4 movie passes. Postal Plus (7827 State Highway N, Dardenne Prairie, MO 63368) for their donation of two free photo enlargements. ​The Cheesecake Factory (Saint Louis Galleria, 1062 St Louis Galleria St, St. Louis, MO 63117) for their donation of a $50 gift card. Thanks to these recent families and businesses who have donated this week. We are currently seeking donations and items for a silent auction for our Hope 4 Hannah race on June 17, 2017. These businesses have graciously donated items and money. Blue Sky Cafe & Bar (9999 Winghaven Blvd., O'Fallon, MO 63366) for their donation of "Lunch for Two"
Fancy Nails (3042 Winghaven Blvd, O'Fallon, MO 63366) for their donation of a "Manicure"
We are so appreciative of all the support we receive. We have been able to help out so many families in the four years we have been a foundation. To date, we have been able to give away more than $28,000 in financial support. BG Services (400 Axminister Dr. Fenton, MO 63026) for their continued generous support of our foundation. They continue to do an amazing job supporting Hope 4 Hannah and allow us to continue our mission. Rehabilitation Services for their grant to our foundation and the Bell family for the nomination for this grant. Students at Boone Trail Elementary (Wentzville School District) who provide annual support each year through fundraising efforts. UMB Winghaven for their generous donation. Kortney Holman -Matilda Jane Give Back Donation program. Girl Scout Troup 4032 and Kiersten Swisher for their fundraising efforts. Kona Ice for donating all proceeds from the snow cones to our foundation. B Halls for allowing us to use their facility each year to wrap Christmas presents for adopted families. Thanks to everyone for your continued help and financial gifts. Our list is long, and I know we didn't mention all our wonderful supporters. We appreciate everything that everyone does to help out throughout the year! Thanks to the Clayco company and all their affiliate companies. In August 2013, Clayco donated over $1,000 from a collection at work. Thanks to Rachelle Morley, Ann Poidomani, Candi Mesnier, and Crossroads Elementary students. Rachelle and Ann organized a large bake sale and food truck sales. Candi organized students to make bracelets to sell at a Crossroads Elementary Family Fun Night in October 2013 . Their combined efforts raised over $2,000. Thanks to Melanie Abel. In May 2014 when Melanie retired from Crossroads Elementary, she had the staff donate to our foundation. 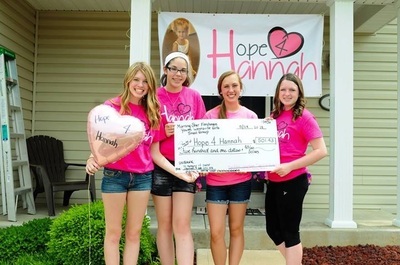 Over $400 was donated to Hope 4 Hannah. Thanks to Boone Trail Elementary 3rd Grade. Students worked hard this spring 2014 to create and sell crafts at a craft fair. Their efforts raised over $1600. Thanks to Dawn and Katie Dains and the Morning Star Wentzville Freshman Small Group for organizing and holding a garage sale in May 2014. Their efforts and hard work raised over $500. Thanks to Reid and Harrison Holliday. For their 6th and 2nd Birthdays the boys had guests purchase games, activities, and other goodies to donate to our organization. The gifts donated totaled over $300 and were given to local children going through cancer treatments.